Can I care for a cat ? Take the cat to the vet when it shows any sign of illness - pet insurance can help offset the cost of veterinary treatment. Moving to a new home is very stressful for a kitten. Give it reassurance and time to adjust to the new surroundings before making introductions to other animals in the household. Make sure all the doors and windows are closed and that there is a guard in front of the fireplace (a dark quiet chimney can be very inviting to a nervous kitten). Make sure that the kitten knows where the bed, litter tray and food bowls are. The kittens' bed should be a refuge to retreat to if things become too stressful. It needs to be warm, dry, comfortable and draught free. There are many types of bed to choose from or you can put some warm bedding inside a strong dry cardboard box with a hole cut in the side. Putting it in a warm secure corner (near a radiator in the winter) will make it welcoming and the kitten feel secure. On the first few nights a warm water bottle under a blanket may help to compensate for the absence of the kitten's mother or littermates. If you happen to have, or can borrow, a large pen (a kittening pen or the type of metal pen used to hold dogs securely in the back of a car) this is ideal for providing a safe den for the kitten and can hold its litter tray and bed. It is also an excellent way to introduce other animals. Introduction to other household residents should be gradual, gentle and very quiet. Excited children can easily injure a kitten unintentionally so always supervise play and do not allow the kitten to be picked up unnecessarily. Children should be encouraged to sit on the floor and wait for the kitten to explore them. Make sure that the kitten is allowed to stop playing when it wants to and is not treated like a toy. Kittens, like many young animals, will need a lot of sleep and should be allowed time to rest. When you first take a kitten home feed it on the same food it has been used to. A sudden change of diet combined with the stress of adapting to a new home can cause stomach upsets and diarrhoea. If you want to change the diet, do so gradually by mixing it with the kitten's usual food. Kittens have small stomachs and have to be fed little and often, like babies. It can be very difficult to put together a homemade diet which provides all the nutrients required by growing kittens - it is a great deal easier to feed a good quality commercial kitten food and spend the time playing with the kitten instead! There are foods which have been specially formulated for kittens because they have different nutritional needs to the fully grown cat. Read and follow the feeding instructions carefully. If the food is marked 'complete' it contains everything the kitten needs to stay healthy. If it is marked 'complementary' it does not supply all the kitten needs and should be fed with other foods. 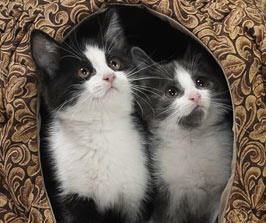 Kittens aged 8-12 weeks need four meals a day, 3-6 months three meals, and kittens over 6 months old, two meals. You may want to provide some dry food on an ad lib basis - it depends very much on your lifestyle, what your kitten likes and is used to and if you have other cats in the house with certain feeding routines and habits. You will need a plastic litter tray which can be filled with sand, peat or cat litter available from pet shops. Earth from the garden should never be used for unvaccinated kittens as it may harbour diseases from other cats which have used it as a toilet. The tray should be placed on newspaper to catch any litter pushed over the side during digging - a large tray will prevent such problems. If you intend to let your kitten out to use the garden in the future then a simple open tray will suffice for the few weeks involved. If you intend the cat to continue to use the tray then you may want to purchase one of the covered types with a lid which gives the cat more privacy, stops smells from escaping and prevents mess with the litter. Place the tray in a quiet accessible corner where your kitten will not be disturbed. Make sure that the litter tray is not next to food and water bowls. The kitten may be reluctant to use the litter tray if it is too close to its food. The litter tray must be kept clean and emptied regularly. Some disinfectants (like Dettol) which go cloudy in water are toxic to cats, so use only hot water and detergent when cleaning out the tray or ensure you use a cat-friendly disinfectant such as bleach which has been diluted as the manufacturer recommends and the tray rinsed thoroughly before use. If your kitten is inclined to mess elsewhere in the house, confine it to one room with a litter tray until the kitten learns to use it regularly. Place the kitten on the litter tray a short time after it has eaten or when it is sniffing, scratching, beginning to crouch and generally showing signs of looking for a suitable corner to use as a toilet. When your kitten starts to go outside more often, gradually move the litter tray towards the door. A few handfuls of cat litter from the tray spread onto well dug soil in the garden will encourage the kitten to dig there. Do not remove the litter tray from indoors until your kitten has started using the garden. Your kitten should not be allowed outside until at least a week after it has finished its first course of vaccinations at about 13 - 14 weeks old (depending on the vaccine). Once it is fully vaccinated and has become used to life in your house, you can start to let your kitten go outside. Choose a dry day (if possible) and a quiet time and accompany your kitten outside, allowing it to explore the new environment. Continue to accompany the kitten until it is used to your garden and can find its way back to the house without difficulty. It is best not to leave your kitten outside alone until it is 6 months old. Cats like to come and go as they please. A cat flap allows them to do this. If you fit a cat flap you won't need a litter tray indoors when the kitten grows up. You can teach your kitten to use a cat flap by propping it open initially and enticing it through with food. Gradually close it down so the kitten learns to push the flap. If you already own a cat be aware that the kitten may watch and learn and let itself outside before you are ready - kittens learn quickly by watching other cats. To prevent neighbourhood cats from coming into your house, you can buy a cat flap which will only open for your cat. The flap is operated by magnetic or electronic keys on your cat's collar. When your kitten becomes older (over 6 months old) you may like to fit a collar on so that he has some form of identification or to carry a magnet or 'key' to an electronic cat flap - never put on a collar just for the sake of wearing one. Collars must be fitted carefully - kittens are very active and inquisitive while growing up and can easily get the collar hooked on a tree branch or fence or the kitten can get its front leg caught up in the collar and injuries can occur. 'Snap open' collars will reduce the likelihood of the cat becoming entangled should a problem occur. For a young, rapidly growing cat you will need to remember to check the collar's fit (you should be able to get one or two fingers under the collar) and increase its size accordingly. Flea collars are not the best way to deal with flea problems and can be an added danger to curious kittens intent on climbing or squeezing into small spaces where they may get caught up. You may also want to consider having your cat microchipped for identification purposes. Kittens are very inquisitive creatures and will investigate small, dark places which they can crawl into. For this reason, should your kitten go missing for any length of time, you should look in cupboards, wardrobes, outside sheds etc in case it has accidentally been shut in or got stuck. Keep the washing machine and tumble dryer door shut when not in use and check them before putting the clothes in. If your kitten is a plant nibbler then remove any plants which may be poisonous, for example Dieffenbachia (dumb cane), Poinsettia, Lily of the Valley, Christmas Cherry, Castor Oil plant, Avocado plant, rubber plant and ivy. Most cats will not touch such plants but kittens may be more inquisitive. If you live in a flat above ground level or have a house with several storeys keep the windows shut to ensure that kittens do not fall out. Outdoors keep garden chemicals stored safely and take care if using slug bait or chemicals on the garden itself - some types can be very toxic to animals. Kittens are very playful. Give them an assortment of toys to keep them occupied and exercised - these need not be expensive - every kitten loves a cardboard box to play in. Play is also a good way for you to get to know and trust each other. Provide your kitten with a scratching post. It is a good idea to accustom your kitten to being groomed from an early age, particularly if it has a long coat. A long-haired cat needs daily attention to keep fur free of tangles. Grooming removes excess loose hairs which can cause fur balls to build up in the stomach. Combing and brushing will help remove these hairs and it is usually appreciated by the cat, provided it has been accustomed to grooming early in life. Grooming also gives you a chance to keep a close eye on your cat, asses its health and help to develop the bond between you. Always be gentle and make grooming a rewarding and pleasant experience. To provide protection against potentially fatal infections such a feline infectious enteritis and feline influenza, kittens need to be vaccinated. The first injection in the course is given at 8 to 9 weeks old and a second at about 12 weeks. The kitten should be kept away from other cats and stay indoors for 10 days after the second injection to ensure maximum protection. To keep up the level of protection provided by vaccination, adult cats require regular boosters (usually one every one to three years). Your vet will tailor the vaccination programme according to the risks of the various diseases in your area. In cities, where there is a high density of cats, the risk of infection will be higher. More information on vaccination.. Even clean cats pick up fleas so check for these while grooming. Flea dirt can usually be seen as small brown specks particularly around the neck and base of the tail. When placed on damp cotton wool 'flea dirt' slowly dissolves producing bloody streaks. For effective control, adult fleas on the kitten must be killed and reinfestation from the environment prevented. Traditional flea preparations - sprays, shampoos and collars - can contain substances that are potentially toxic to kittens and may not be very effective. Your vet can supply a number of new products to kill fleas that are very safe because they act at receptors that are not present in mammals, only in insects. The 'spot-on' products are very easy to apply and can be used from a young age. Many cats have ear mites. Often there are no symptoms but in some cats they cause irritation leading to the production of a greyish/brownish matter in the ear. In severe cases the ear canal becomes blocked and infection follows. Even if the mites do not cause a painful reaction they can be very irritating and can be passed to other cats and dogs in the household. If you have a dog which is persistently getting trouble with ear mites, your vet should check your cat's ears too as they may be the source of the mites. If your kitten's ears appear dirty, itchy or full of dark-coloured wax it is worth checking the problem with your vet. Each year many unwanted cats and kittens have to be put to sleep or are left to fend for themselves because there are not enough homes to go around. Neutering your cat ensures that you do not contribute to this problem. A male cat can be castrated from four to five months of age. Neutering will reduce the likelihood that he will spray indoors to mark his territory. He will also spend less time roaming in search of mates and thus has less of a chance of being run over by a car or getting into fights. Cats which are bitten and scratched in fights are more likely to be at risk from infectious diseases.